The Little Lace Museum | The Chantylace Collection of Antique Irish Lace. 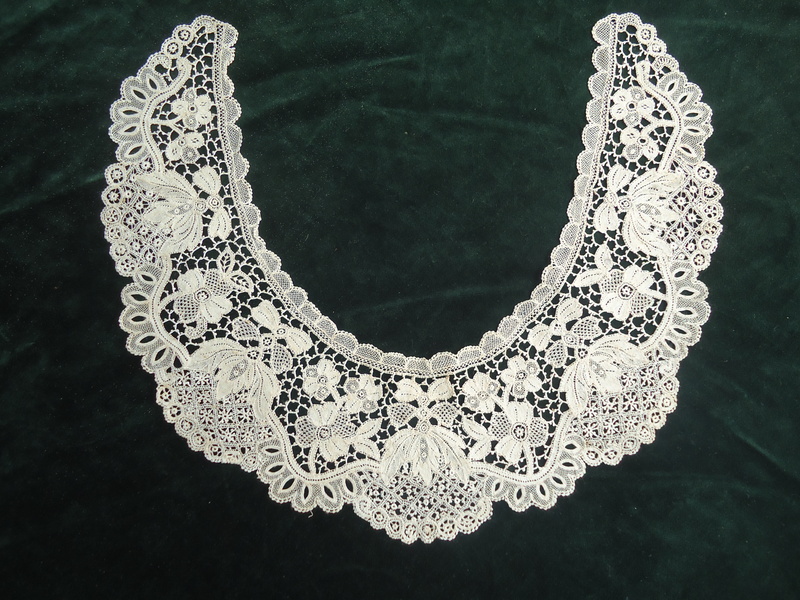 A Limerick Lace Bertha Collar. 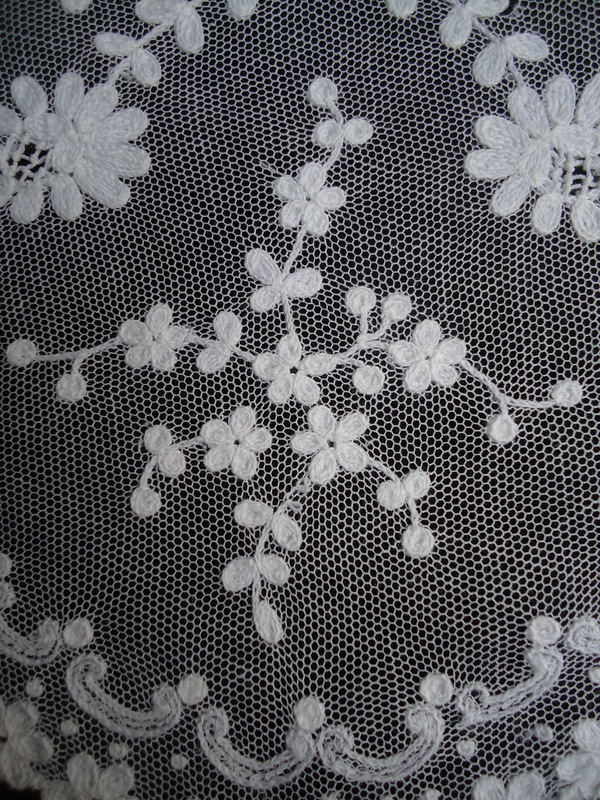 Limerick Lace is a form of embroidery on net. There are two varieties, one is Tambour Lace, a chain-stitch done by hand with a Tambour Hook while on a Tambour ring or in a frame. 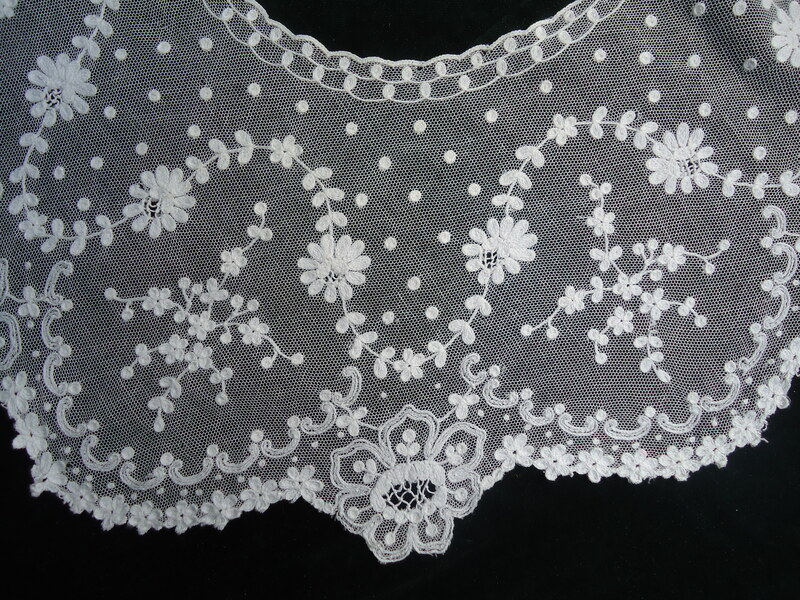 This very wide Bertha Collar is Limerick Tambour Lace, the design is Flower Garlands, Ribbon Bows & Dots… The design is done in a cord thread in a chain-stitch with a Tambour Hook and then filled in with a sewing needle and thread in a darned stitch. 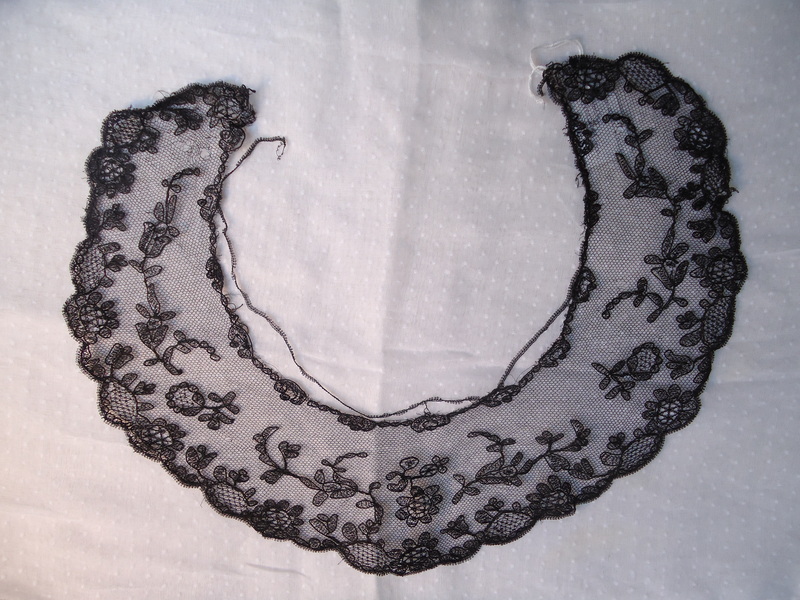 Black Mourning Limerick Lace Collar. 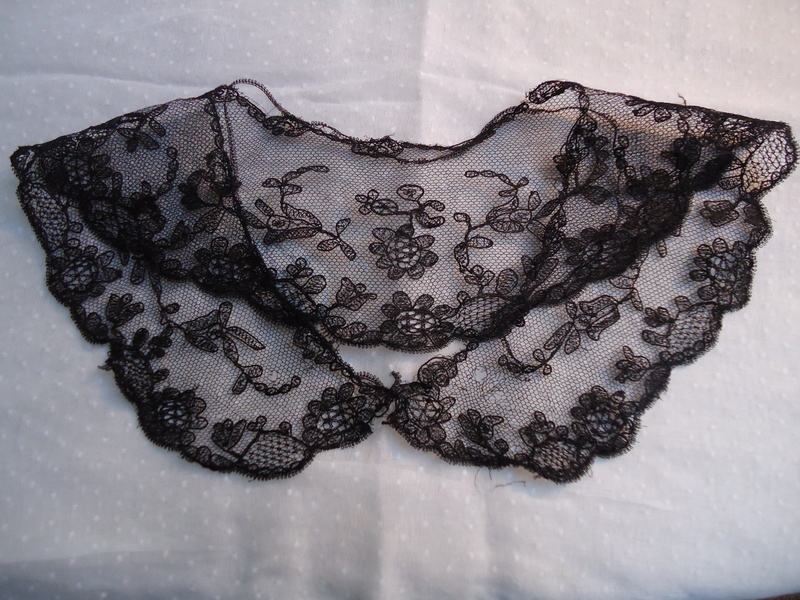 Black Lace was only ever made for Mourning in Ireland, whereas it was very fashionable to wear Black Lace in the rest of Europe and was very widely made. 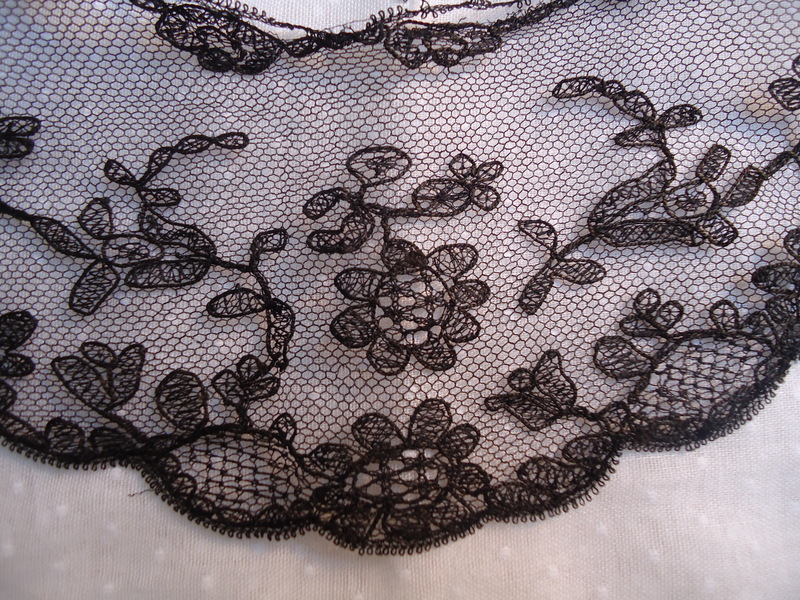 Limerick was the main producers of Black Mourning Lace. 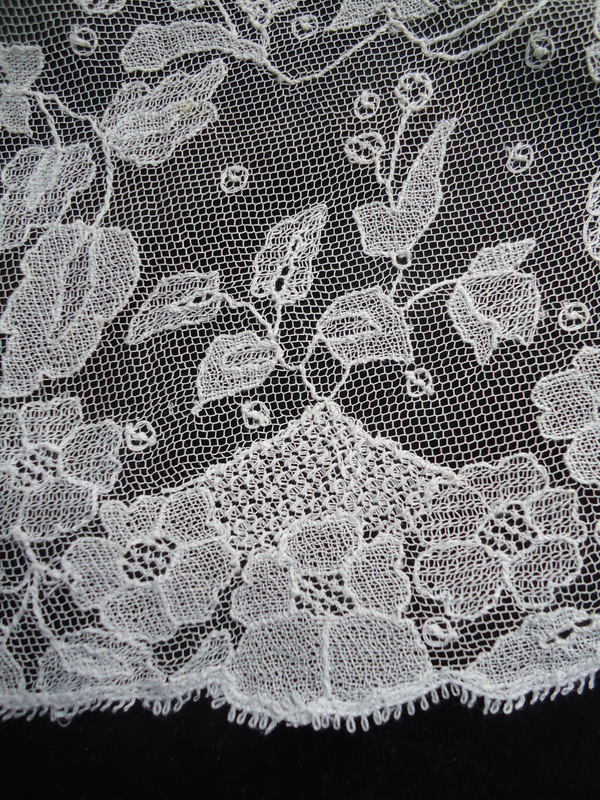 Needlerun Lace is one variety of Limerick Lace. It is worked with a sewing needle in a range of fancy stitches darned onto a net background. 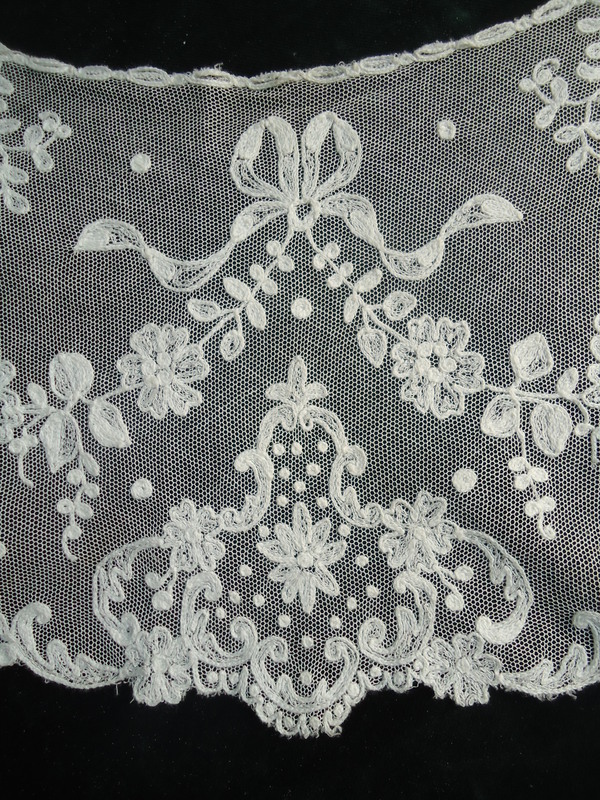 T he making of this type of lace became possible when machine-made Net became readily available. 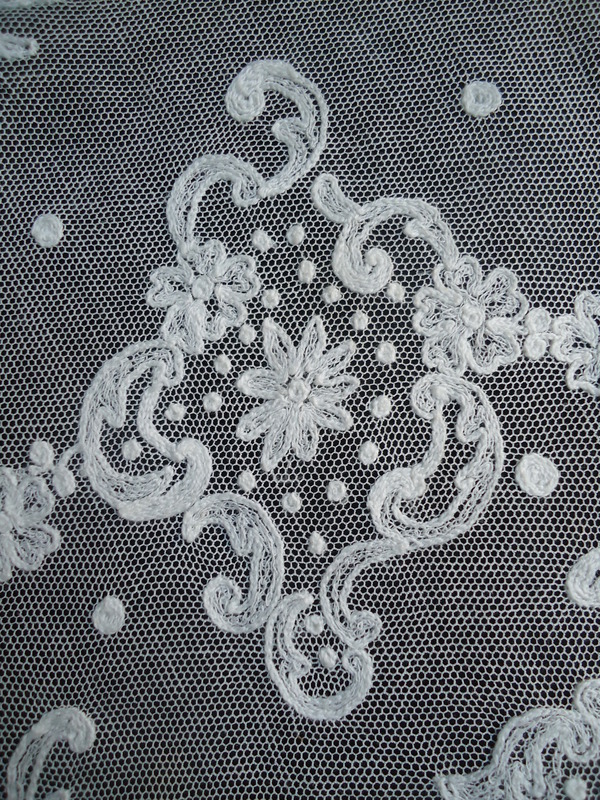 Limerick Lace is a form of embroidery on net. There are two varieties, Tambour Lace, a chain stitch done with a Tambour Hook while on a Tambour ring or frame. 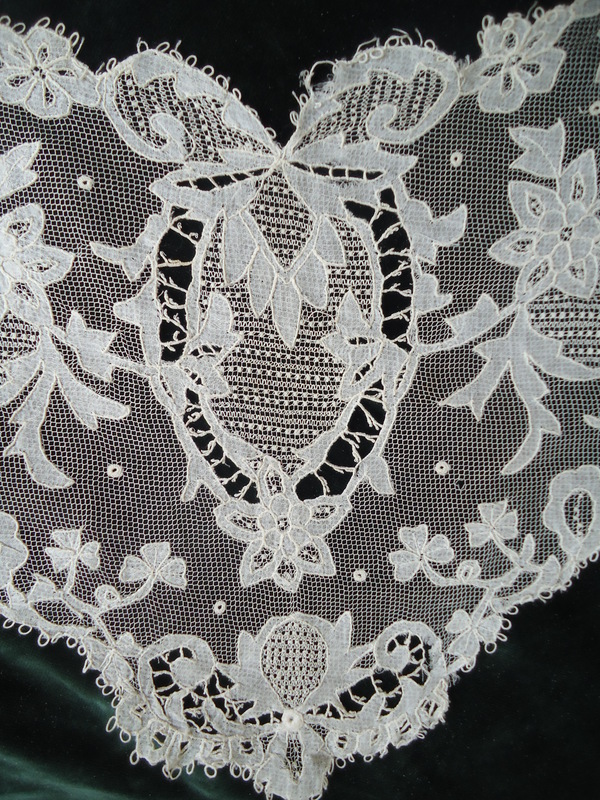 And Needlerun Lace, which is worked with a sewing needle and darned on to the net, in a range of different fancy stitches. Both techniques can be used in combination for a certain piece or within a design. Flower Garlands, Baskets, Shamrocks & Dots are regular features. In 1829 Charles Walker, a native of Oxfordshire, set up a Lace factory in Limerick. He brought with him twenty-four young women “skilled in the art of Lace embroidery” as teachers. It was the first Irish Lace-making venture set up on a purely commercial basis. Charles Walker had married a “lady who was mistress of an extensive lace manufactory in Essex”. He did a short tour of Ireland before choosing Limerick to set up his first factory which was in Mount Kennet, beside the river. There was a large population of unemployed women and there had been a thriving Glove-making industry in the previous years and a tradition of factory work. The Lace industry in Limerick prospered & the numbers Mr. Walker employed were amazingly high, it was reported in about 1840, that he employed 1,100 Girls, about 800 of whom were apprentices working in the factories at Limerick & Kilrush, while about 300 were employed at their own homes in the counties of Limerick & Clare. He had invested a very substantial amount of money into setting up the Lace factory, and ran a very successful business. He marketed and sold very well in England, and had his own outlet in London. A Mr. Lloyd made annual trips to the Continent, visiting Brussels & many Lace-making parts of France to collect new designs to keep up with the fashions. There were many other names and partnerships within the Limerick Lace Industry, one such partnership to note was Lambert & Bury, who employed another 700 girls. There were a total of 3,000 employed within the Limerick Lace Industry in the mid. 19th Century. This must have added a considerable amount to Limerick’s economy. 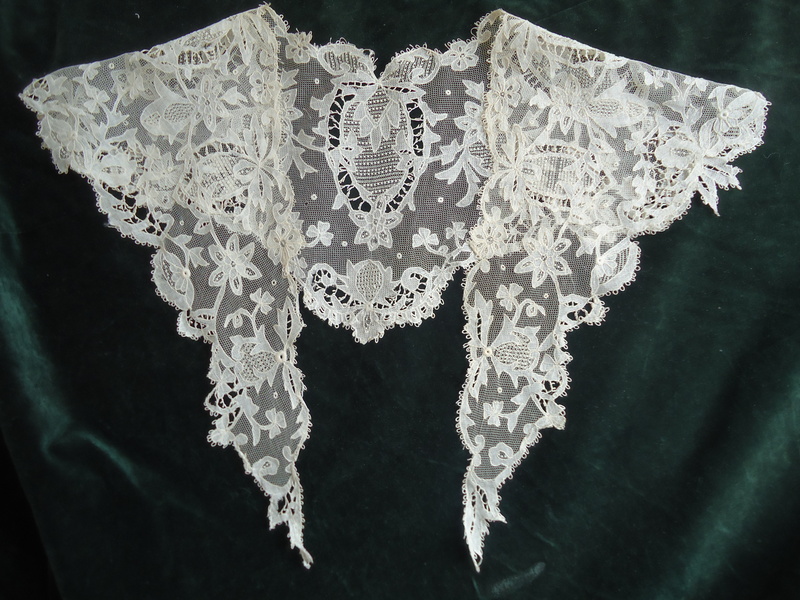 After Mr. Walkers death in 1843, there was still large quantities of Lace being made, but sadly many of his best teachers returned to England and the standard seemed to fall over the next few years, and there was no attempt to change or improve Designs. In the 1880’s a revival took place. 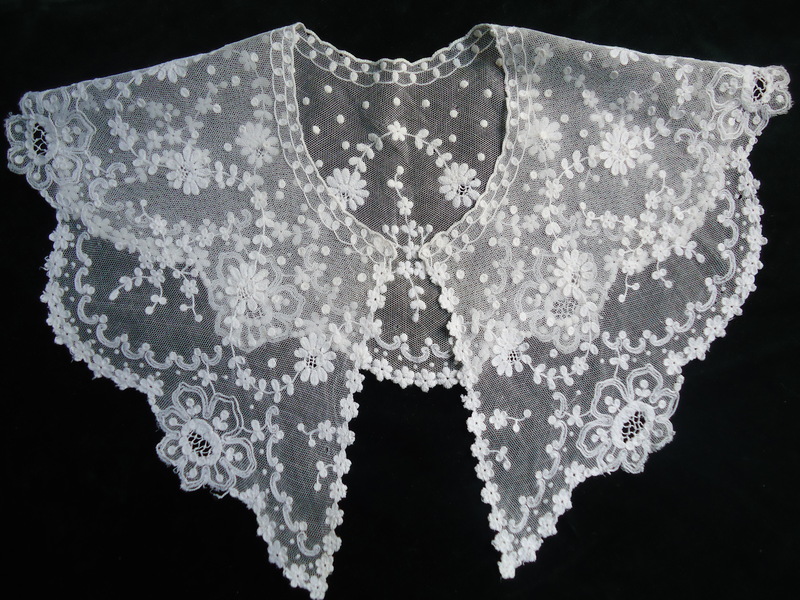 The Good Shepherd Nuns of Limerick had started making Lace, but mainly, it was due to the work of Mrs. Florence Vere O’Brien. Her achievements and contributions are so important. She was an amazing designer, a very influential person and set a very high standard for quality, design & craftsmanship. She also set up the Lace-training school in Limerick in 1893. Mrs. Florence Vere O’Brien worked with Mr. James Brenan, R.H.A. Master of the Cork School of Art, which later became the Crawford School of Art. Their aim was to make it easier for women to undertake artistic & technical training. 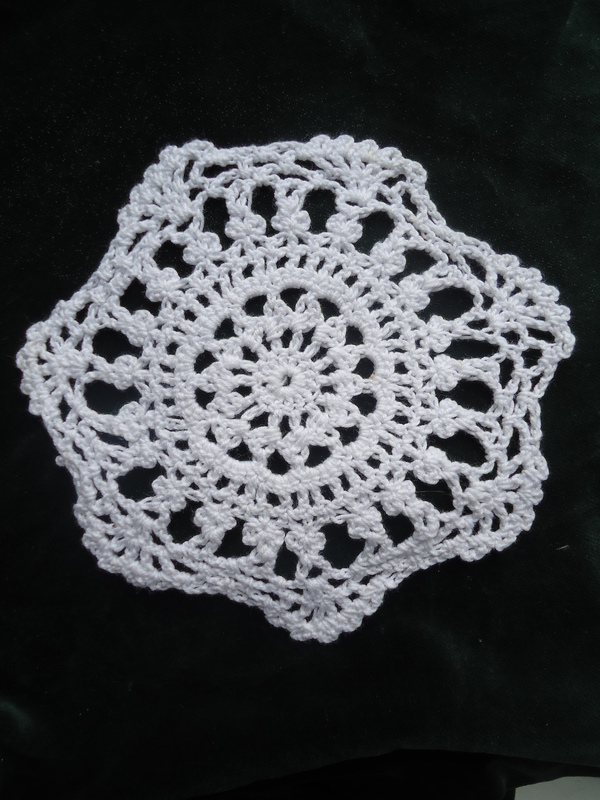 I rish Crochet Lace is probably the most common and the most widely made Lace around Ireland. It is broadly similar to ordinary crochet except for its fineness. It is worked with a very small fine steel hook with a handle of bone, cork or wood. The best results are made with a hook & thread of the same thickness, Cotton & Linen thread is used. The hooks are known to be very small indeed, they were sometimes made by removing one side of the eye of an ordinary sewing needle and sticking the point in a cork as a small handle. The design is drawn on glazed Calico and the motifs are worked individually and then tacked in place on the Calico. Then they are joined by Crochet Bars & Picots. 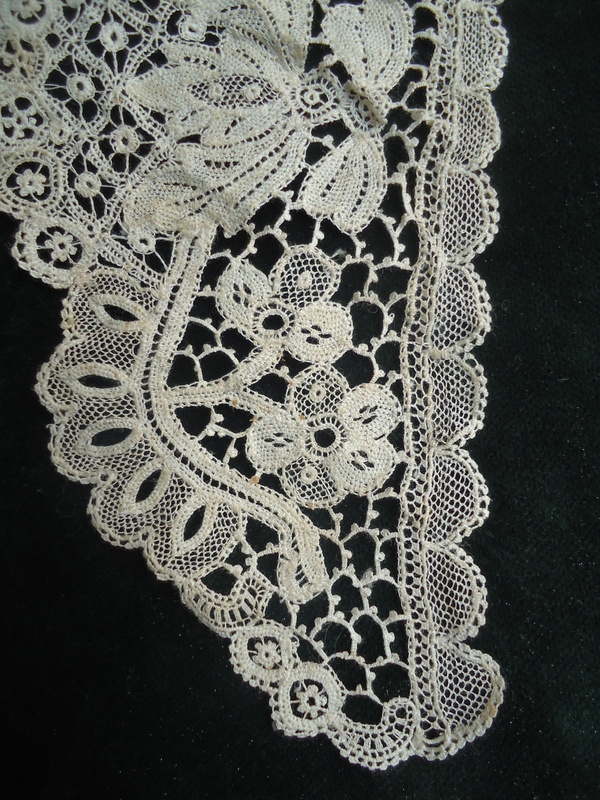 The complete piece of Lace is then finished off with one of the edgings characteristic of Irish Crochet Lace. Designs for the motifs are Flowers, Roses, Shamrocks, Horse Shoe, Fern, Wheel & Cross. For raised motifs they are worked over a cord padding, which is formed from two, three or four strands of cotton cord. 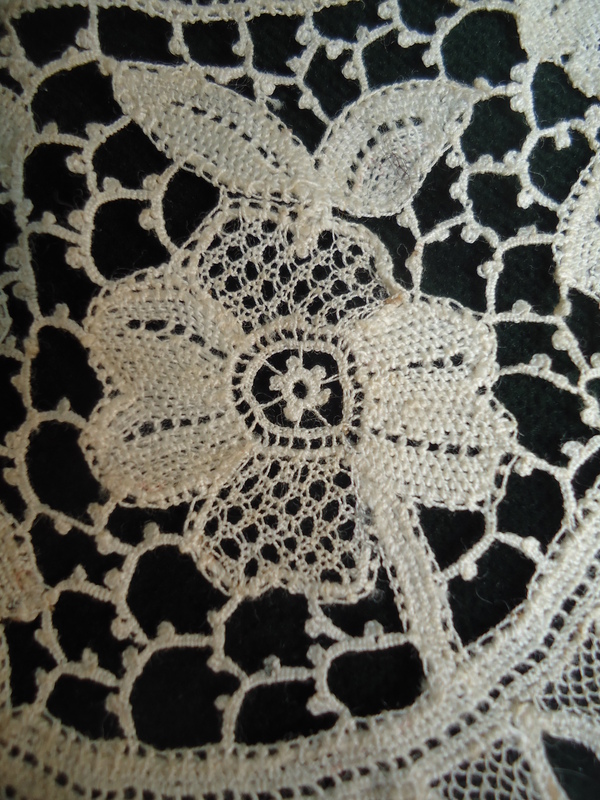 The cord is a very important element in the Lace as it allows movement within the motifs when it is being joined by crochet bars & worn as a Garment. T here are many center-points for Crochet Lace around Ireland such as Clones, County Monaghan, Blackrock County Cork, County Kildare & Lisadell County Sligo to name but a few. The History of Crochet Lace made in Ireland is a little unclear. It could date back to the 16th century when it was known as ‘Nun’s work’ developed in Irish convent communities & relating to continental European Lacemaking styles. 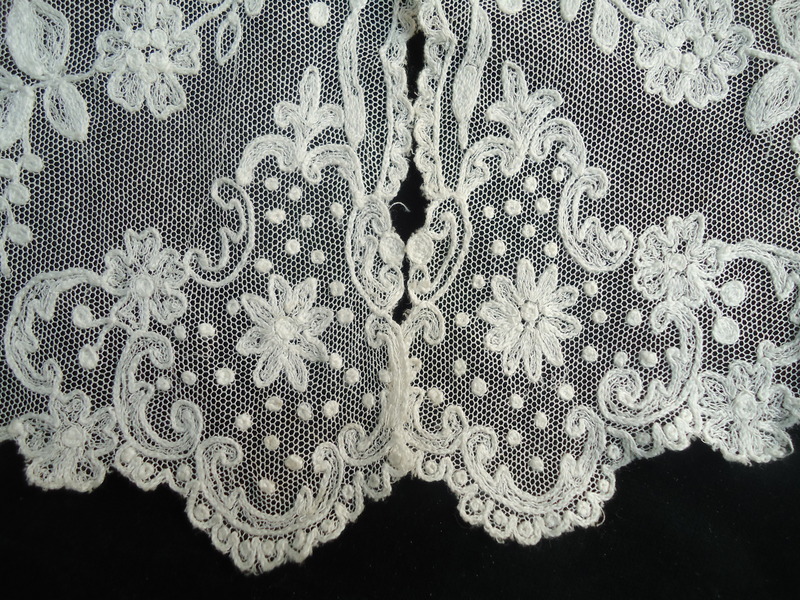 In 1743 Lady Arabella Denny introduced Lace-making to Workhouses for the poor in Dublin, & it is thought that it was an early form of Crochet, imitating the appearance of Venetian Gros Point. It is also suggested that a group of Ursuline Nuns brought the skill of Crochet back to Ireland from Paris in the 1790’s. It is recorded that one of the first Irish Crochet Lace Schools was held at the Ursuline Convent, Blackrock in County Cork and it was established in 1845. There the Nuns held classes and trained teachers in the art of Crochet Lace. It can also be associated to Spanish & Venetian Needlepoint, such as Venetian Gros Point which can dates back to the 16th& 17th centuries. D uring the Famine years of the 1840’s the Irish Lace Industry contributed to the survival of many Irish families. Though Famine relief schemes and by giving employment they relieved starvation in communities. The ‘Crochet centers’ were established in Convents around the country and became a symbol for the Irish people of life, hope & pride. In the years immediately after the Famine, Crochet became a practical subject in the curriculum of Convent schools. The Rev. Thomas Hand’s (1805-1874) wife, Mrs. Cassandra Hand (1809-1868), of Bishopscourt, County Monaghan was largely responsible for establishing Clones as the main Irish Crochet Lace center-point in Ireland. Within a few years of the Clones School opening in 1847, there were about 1,500 workers employed, directly or indirectly and Mrs. Hand successfully turned the image of Crochet Lace from ‘Nun’s work’ to an attractive Cottage Industry. 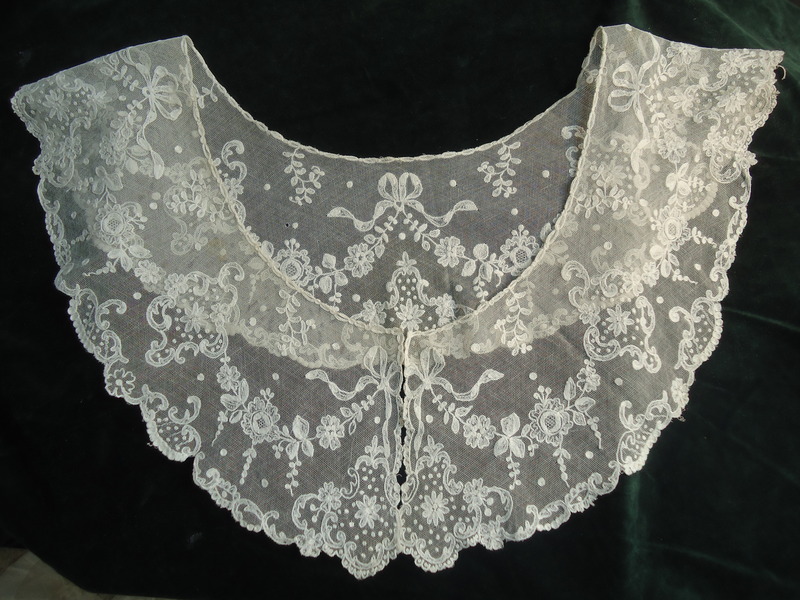 The fashions at the time created a great demand for Lace and Crochet Lace was a fine player, as it was perfect for Blouse Bodices, Cuffs, Ruffles, Trimmings and even whole Dresses. 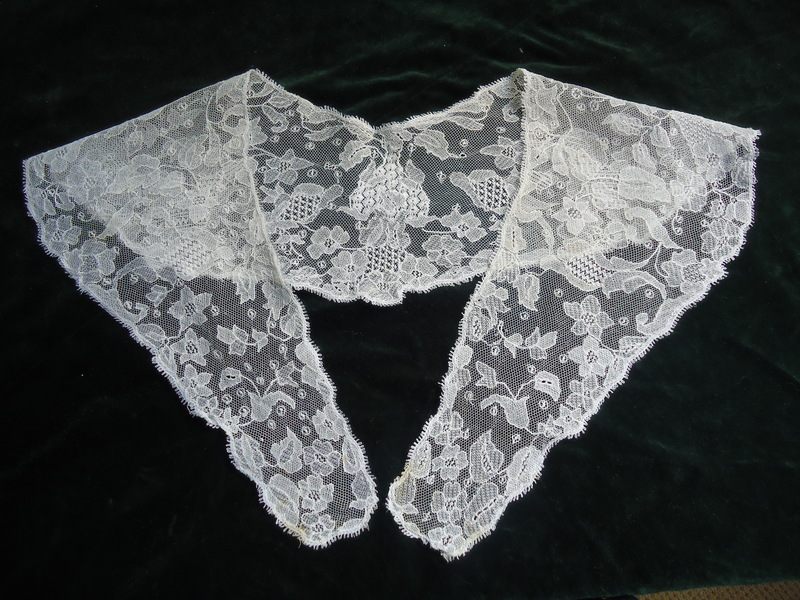 Men wore Crochet Lace in the form of Jobots, Lappets & Cravats. Mrs. W. C. Roberts, of Thornton, Co. Kildare, had a large Crochet Lace class in Kilcullen, under a Famine relief scheme and was very successful in training Crochet Lace teachers that then traveled & worked all around Ireland. In 1879, another Lace school was started by Lady Gore-Booth in Lisadell, County Sligo. The Gore-Booth School was held in a large square building on the grounds of Lisadell House, and employed workers from the Estate. They made Crochet Lace, White Embroidery & Drawn Tread-work. The Design teacher was Miss Elizabeth Flanagan, a graduate of the School of Art in Dublin. County Cork was recognized as the main center-point for Irish Crochet Lace in the South of Ireland. With the work of the Ursuline Nuns in the Convent in Blackrock, County Cork, in 1845. Mademoiselle Riego de la Blanchardiere, must also be mentioned. She is generally credited for being the “Inventor” of Irish Crochet Lace but this is by far not the truth. She contributed largely to the Crochet Lace industry. She published at least 70 Pattern Books, and on the title page of her first book she describes herself as a ‘Teacher of Fancy Works’. This was published in 1846. She also recieved Royal commissions from Queen Victoria & other European Princesses. Youghal Lace is the finest Irish Needlepoint. It is created entirely with a Needle & Thread. The pattern is transferred on to a dark coloured material by using a hot iron. The material with the pattern is then tacked on to several layers of cloth to give it strength. A foundation cord is couched down with a fine thread outlining the whole pattern. Once this outline cord is in position, the spaces can be filled with a range of different fancy stitches to form the Lace. Most of the stitches are derived from old Venetian & French Needlepoint Lace’s, but some are completely original to Youghal. The distinctive feature of Youghal Needlepoint is the tiny knotted border edging that completes each piece. 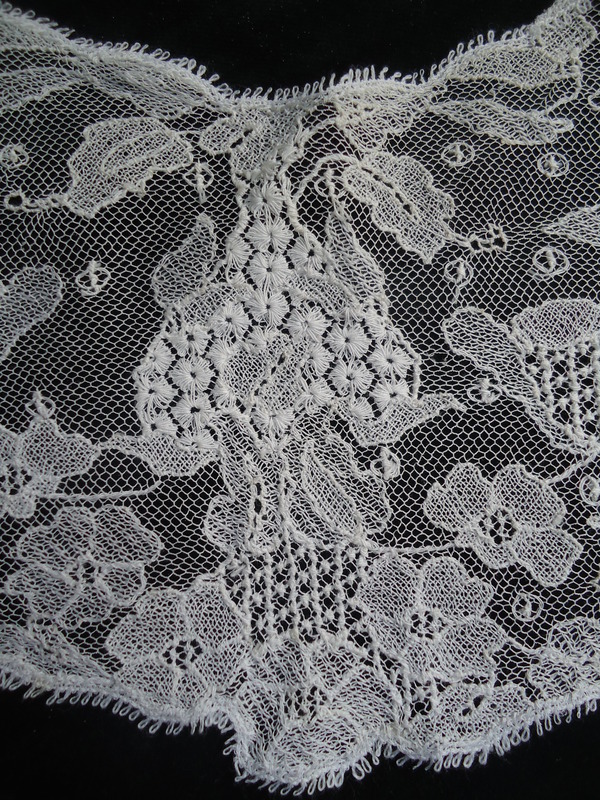 By snipping through the tacking stitches of the backing cloth the finished Lace can be removed from the pattern. 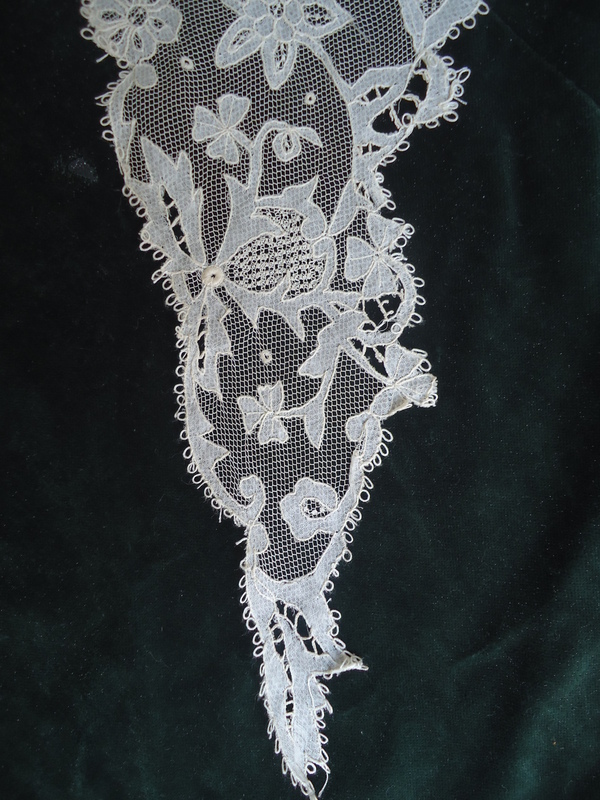 Youghal Needlepoint Lace was so sought after for its Delicacy. Mother Mary Ann Smyth of the Presentation Convent in Youghal, County Cork, set out to help the people of the town during the hard times of the Famine. By unpicking some antique Venetian & French Needlepoint Lace’s, and examining the stitches she created a method of her own, and a truly original characteristic style of perfect workmanship. As the girls in the Youghal Convent were not trained in Art so many designs for patterns were adapted from pieces of china. It was only a matter of time before a drawing master was employed and then soon after the Lace School was set up in about 1852. The making of Irish Needlepoint soon spread to other Convents in places such as Kenmare, Killarney & New Ross, all thriving industries in their time. Kenmare became a large centerpoint for Needlepoint. The main difference being that Kenmare is worked in a Linen thread and Youghal is worked in a Cotton thread. This fine & delicate Needlepoint was extremely expensive, mainly bought by Royal Families & many pieces went to the Vatican.